Mere moments before approving an ethics reform bill Tuesday, the Senate Committee on Government Operations stripped out one of its most significant provisions: a ban on government contractors donating to the political campaigns of those who employ them. 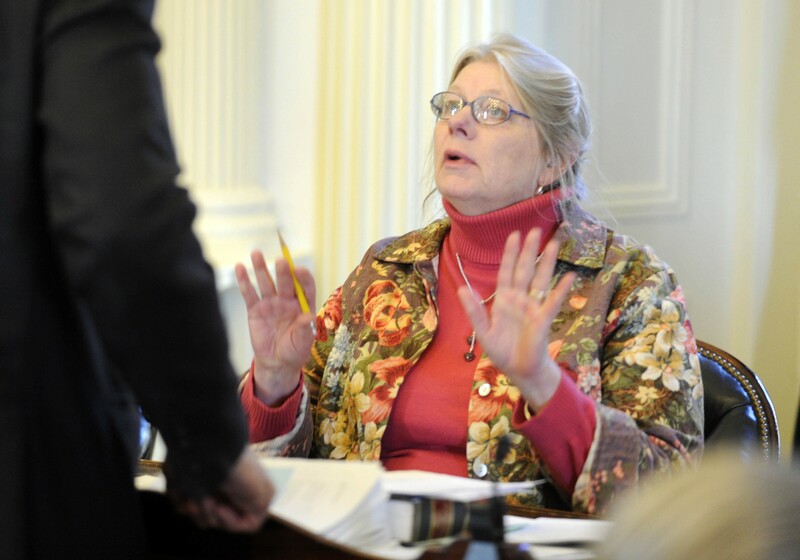 "I just proposed that we take it out because I actually am not comfortable saying that anyone with a contract can't donate to a gubernatorial candidate," the committee's chair, Sen. Jeanette White (D-Windham), explained Wednesday. By Thursday, White had changed her mind. "I do philosophically support it," she said. "I think we didn't have enough time for a detailed conversation." Now, even though her committee has sent the ethics reform bill to its next destination, the Senate Appropriations Committee, White and her committee colleagues plan to author a floor amendment that would restore the pay-to-play ban. "We got some more information," she said Thursday. "Isn't that the way things happen around here?" White's committee spent months crafting the bill, which would create a five-member commission charged with vetting ethics complaints and referring them to the Attorney General's Office or the Department of Human Resources. The new commission would be staffed by a part-time executive director and would not have enforcement powers. The bill would ban former lawmakers from lobbying for a year after leaving office and would require political candidates to disclose sources of income greater than $10,000. Central to the legislation, at least until Tuesday, was a provision that would ban those who bid on or enter into a contract with a state office from donating to a candidate for that office. It would also prohibit officeholders from soliciting such contributions. The provision was inspired by a scandal that engulfed Attorney General Bill Sorrell last spring. Representatives of a Texas law firm donated $10,000 to Sorrell's reelection campaign at a December 2013 fundraiser while simultaneously asking him to sue the oil and gas industry over groundwater contamination. Sorrell later filed suit and hired the firm to represent the state. Sen. Anthony Pollina (P/D-Washington), who authored the bill, said the pay-to-play ban could prevent similar situations from happening in the future. According to White and Pollina, committee members took a brief break Tuesday afternoon before taking a final vote on the bill so that a legislative lawyer could put the finishing touches on it. Reporters for the Burlington Free Press and VTDigger.org used the downtime to query the lawmakers about how the pay-to-play provision would work. Apparently, they didn't really know. "Senators were hazy about who would be impacted by the ban on contractor political contributions after working on the bill for nearly three months," the Free Press' April Burbank wrote. "We were asking really some pretty basic questions," VTDigger's Mark Johnson said Wednesday. "It did seem a little odd. I think we were both surprised that there were questions — that no one else had kind of thought of these hypotheticals before. But not everyone can think of everything." According to White, she hadn't realized that the bill would have prevented even small-time state contractors — such as those paid to mow a lawn — from contributing to a gubernatorial campaign. "If I have a contract to clean, does that really mean that I can't support my favorite candidate?" she asked Wednesday. Pollina suggested that the committee limit the ban to those who make more than, say, $50,000 from a contract, but his colleagues felt uncomfortable making such a change at the last minute. So they voted 3-1 to remove the pay-to-play ban and then approved the bill unanimously. "We just said, 'The House will deal with it,'" White said Wednesday, meaning that the House Committee on Government Operations could restore the ban when they took up the bill. "I know that's kind of a wussy way out." Vermont Public Interest Research Group executive director Paul Burns, who had advocated for the provision, said he was "shocked" that the committee removed it at the eleventh hour. He said he had left the committee room earlier that afternoon thinking the bill had been finalized, only to learn of the change later. "This is why people don't trust government — actions like this," he said Wednesday. "Particularly when what we're talking about is a reform that was intended to address corruption or the appearance of corruption in government." Burns may yet get his way. White said Thursday that she had since learned more about how a similar ban works in Connecticut. She said her committee had been under pressure to complete its work Tuesday and didn't have the time to properly vet the pay-to-play provision. "We had to have the bill out that afternoon," she explained. "The bill would've stopped dead in its tracks, right there, if we hadn't gotten it out." She said the committee now plans to take up an amendment Friday afternoon to restore the provision. "The long and the short of it is I think all of us felt sort of bad for taking out a major portion of the bill," said Sen. Joe Benning (R-Caledonia), who voted to strip the provision, but who now wants it to pass. "I don't think I've ever changed on that issue," he explained. "The problem was we didn't have enough information, and I didn't feel comfortable about passing something without at least having a good, thorough go-through."